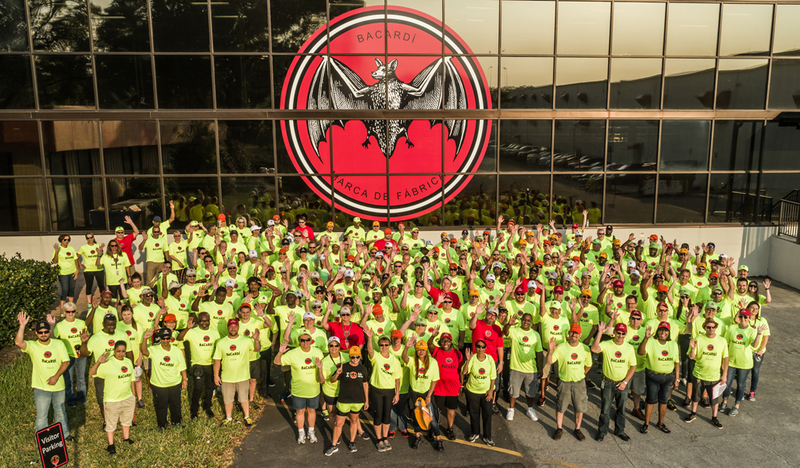 We have a responsibility to keep our people safe at work and our vision is an accident-free Bacardi. At our manufacturing sites and offices, the safety of our people always comes first. In FY18 we held 12 Safety Days at manufacturing sites around the world, with more than 1,400 employees engaged in learning and sharing best practices in our safety culture. Each year we work towards our global goal of less than one Lost Time Accident (LTA) per 1,000,000 worked hours (by 2023). While we have made excellent progress over the last few years, we ran into challenges in FY18. Out of 23 manufacturing sites operating at end of FY18, 11were accident-free for more than one year. This accomplishment can be attributed to one of our core safety behaviors - taking care of your coworkers. It is up to each employee to look out for each other and be more involved in pointing out hazards in the working environment; everyone is responsible for engaging in an accident-free work environment. In FY19 we will focus on reassessing our safety fundamentals to ensure full compliance at all our operations sites and on supporting our most recently acquired sites in their safety culture journey. Improve overall B-Safe Observations* rate by 30% vs FY17. While we started to report this rate globally in FY16, we believe our FY17 target was most likely set too low with activities expanding. Our FY18 target is reasonably ambitious as B-Safe Observations reinforce safe behaviors and correct unsafe behaviors through feedback. This is one of the key elements of our safety culture and is contributing to the improvement of our safety performance. This target will be supported by the training of 100% of our employees in all our manufacturing sites in conducting B-Safe Observations. B-Safe Observations rate was improved by 57% vs FY17. This rate was achieved by getting 100% of our employees trained as B-Safe Observers in all our manufacturing sites. Overall LTA rate of less than 1 per million of worked hours by 2023. Overall LTA rate was 2.0 per million of worked hours. Unfortunately, we ran into challenges at our manufacturing sites and had a 3.8 LTA rate (with 17 LTAs) against a target of 1.6. We are launching additional supporting programs to reach our overall safety goal of having less than 1 LTA per million worked hours by FY23. Safety First program** – achieving all Silver standards by FY18 in all plants Silver level was achieved in all active Bacardi plants, with new locations achieving Bronze level. * B-Safe Observations are behavioral based safety observations and feedback, based on best practice Behavioral Based Safety programs, to positively reinforce safe behaviors at work, started at Bacardi in 2009. All employees at our manufacturing sites can conduct B-safe Observations as long as they receive the proper training. **Safety First is our Bacardi-created program to raise our safety culture, designed with four levels: Foundation (Bacardi mandatory minimum standards), Bronze (safety practices right above mandatory), Silver (advanced safety practices), and Gold (‘best practice’ safety practices according to top external benchmarks).